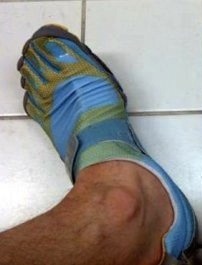 The much anticipated Vibram Five Fingers Bikila seems to have been cloaked in mystery. Maybe this is just the way Vibram operates, but they’ve been almost Apple-like in keeping closed lips about launch date and final design of the minimalist shoe. It’s kind of a surprise, I guess, to those in the barefoot running community to learn that Vibram never really designed their footwear or running. So, it’s very exciting to see what they come up with when they put their mind to it…Bikila! Birthday Shoes posts three new stories on the Bikila. None are a lot more illuminating than past info, but they do confirm (sorta) that April is the release month, and more importantly, one of the stories tells you how you can enter a contest for a free pair. Go for it!!! And let me know if you hear anything. This entry was posted on March 18, 2010 at 3:48 pm and is filed under Barefoot Running, Research. You can subscribe via RSS 2.0 feed to this post's comments. I just purchased the Sprint Virbram. Can’t wait to try them out! Any tips? Not sure what kind of tips you are looking for. If you are new to barefoot style running, check out this getting started guide from Barefoot Jason http://barefootrunninguniversity.com/howtostart.html.